Learn two approaches to championship-level motion offense! This video will give you two approaches to motion offense that can excel from youth levels all the way up to championship college programs! Highly successful coaches Todd Lorensen and Jeremy Shulman combine to demonstrate the skills, drills, and spacing needed to develop an offense that incorporates all the elements of today's "pace and space" game. Many teams are moving to a "positionless" approach to basketball as defenses continue to adapt to today's offensive strategies. Coach Lorensen shows you how to develop the basic cutting, screening, and passing skills needed to maximize effectiveness in the positionless motion offense, including an automatic skip pass action that generates three to five additional lay-ups per game. How to develop a two-foot jump stop technique to help players avoid charges and blocked shots. Drive and drift motions that free up your best shooters for stand-alone 3-point shots. How to tailor your offense to exploit specific opposing team weaknesses. 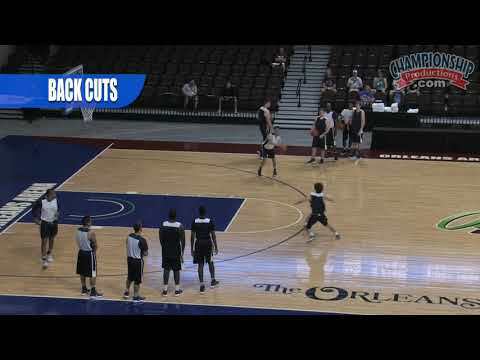 A rapid fire drill that improves spacing and increases the number of shots players get in practice. Lorensen shows you 12 two- and three-man drills that emphasize skills such as basket cuts and spacing on dribble penetration. Additionally, you'll learn how different sets can help you identify and exploit mismatches and get expert advice on how to transition into basic motion sets from a variety of spots on the floor. Learn the seven layers to Coach Shulman's motion offense that allowed his team to average 1.2 points per possession on offense in its 2016-17 National Championship season. He breaks down how each action combines to build an offense that is extremely difficult to stop and virtually impossible to scout. These layers will help you progressively install additional complexity into your system over time. How to space after ball screen action to pressure the defense and drastically reduce the possibility of a steal. Three ways to use off-ball motion to open up driving lanes and help your players get more lay-ups. How to neutralize an aggressive switching defense. The best way to take advantage of post positioning to get easy shots. This offense will be simple to teach and easy for your players to understand while creating numerous ways to challenge your defense. Don't confine your players into roles! Expand their skill sets and basketball intelligence by playing in this open system that will empower your team to make plays by making great reads and reacting on the court.